Every one of us needs a strong dose of “System Thinking”. Do you agree? Every one of us needs a strong dose of “System Thinking”. This includes all of us – those in the Government, business, professionals, academics, fellow citizens, …. Do you agree? Recently I posted the two comments in the LinkedIn as noted in this message. I wrote them as a response to two blog essays. These essays suggest a need for a strong dose of System Thinking – looking at the big picture, as a whole and not in bits and pieces. 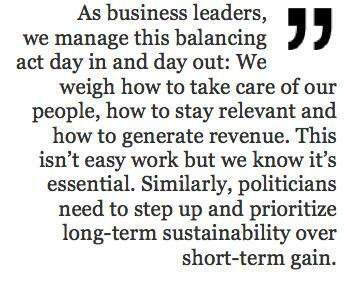 We agree with this need for a focus on long-term sustainability and not on the short term gains. We also need to recognize complexities of Democracy and each of us need to do our part. If you hired 500 workers and about thirty among them said “we want to bring down the President of the company no matter what”, then what will you do? Suppose these thirty employees are also guaranteed that they cannot be fired from their job – thanks to “safe seats” – then what will you do? Suppose the “supervisor” – the speaker in this case, does not want to take any action and side line these 30 workers, then what will you do? You cannot fire the supervisor ad-hoc and you need a rigorous process – next election ? – Then what will you do? It is time the CEOs and journalists and those who fund these non-performing employees and their elections speak up and say “enough is enough” and call the spade a spade! The political correctness and being superficially equal to all sides can be very harmful. The poor who are affected by sequestration and the un-insured who are poor do not have any voice. The rest of us who are fortunate not to be poor or be already insured also need to speak up. Beyond that, ballot box is the loudest voice available. That is the price and privilege of democracy. Other than that, we can call upon the national pride and plead with those who are driven by ideology to think of the nation at large, her economic needs and avoid the deep self-inflicted wounds. System thinking also requires attention to details and avoid pithy phrases and cliché. Commenting on the current crisis in Washington, one blogger wrote: “Don’t hate the players, hate the game”. What does it really mean? Drop the rules and principles of a democratic process (the game), because few politicians want to impose their will ad-hoc? At the end of the day, any system or organization works only to the extent the people play by the rules. If required, rules can be changed again through a set of rules established for such change. “Don’t hate the player, hate the game” means nothing when the game is not played by the rules! You can not play basketball with those who want to spill water on the court to deliberately injure some players! This will happen when people coming to the basketball court not to play ball but cause havoc to those who want to play. President Obama was elected twice and the ACA was passed by the congress, upheld by SCOTUS and was re-affirmed through a national election. Now 30+ congressman from districts where Obama was defeated by 20% or more, do not want to play ball. This is like a few players from a team who lost the game don’t want to leave the court, instead want to rip and tear the court. Sadly there is no security force that can be called upon for this unruly behavior! The only people who can fix this are those voters in these “safe districts” who need to talk sense into their elected representatives. Otherwise those fellow citizens will be the laughing stock of the nation. Are they listening?